I usually drive past Split Rock Lighthouse on Lake Superior’s North Shore without stopping; after all, I’ve been there before. Of course, that was more than 20 years ago and on this particular July day I was tired of being in the car and the sky was threatening rain, making any sort of hike an iffy proposition. It was time to revisit this Minnesota icon. Split Rock Lighthouse stands atop a cliff 130 feet above the water in what was once an isolated and dangerous section of the shore. The station was commissioned after particularly brutal storm in November 1905 destroyed or damaged 29 ships and led to the deaths of 33 sailors. It began operating in 1910. Today you can tour the lighthouse, climbing the narrow winding stairs to the top where the original Fresnel lens still slowly spins. The kerosene light was electrified in the 1940s and then shut down in 1969 when modern navigational equipment made it obsolete. These days the light is only lit on November 10th in memory of the 29 lives lost in the 1975 sinking of the Edmund Fitzgerald. It’s a dangerous and unpredictable lake, even though it may not look like it under a blanket of low laying clouds on a still summer day. The lighthouse’s most valuable contribution to navigation was not its light, but the massive foghorn that sent its warning far out over the water. (It’s very loud.) Today the building that housed equipment used to power the foghorn is a museum, as is one of the lighthouse keeper’s homes. This was an isolated posting for the light’s first keepers, who could only receive supplies and visitors via water before the first road came through in 1924. For those early lighthouse keepers, visitors were infrequent and families were usually far away. Only in the 30s did the lighthouse regularly serve as a year-round family home. This is the period preserved in the house museum, where costumed interpreters bring to life the stories of the people who once lived and worked at the very edge of this sometimes wild lake. 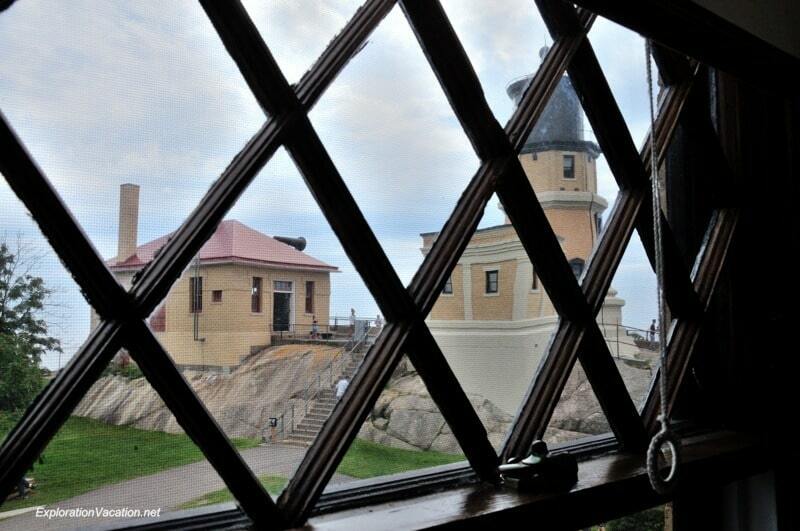 The Minnesota Historical Society manages the Split Rock Lighthouse today. No longer isolated, the Split Rock Lighthouse is located along the very busy North Shore Scenic Byway.